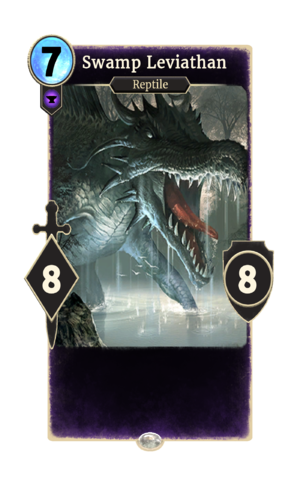 Swamp Leviathan is a common Endurance creature card. It is part of the Core Set. In addition to the card's availability in the Core Set, two copies are included in the Black Marsh Smugglers deck, and two copies in the Telvanni Ambition theme deck. One copy is also obtainable in the Black Marsh Smugglers deck as a reward from Broadsides [the initial deck has two copies, you gain a third from this battle]. This page was last modified on 24 September 2018, at 23:24.